Ananka's Diary: Mysterious Prowling Panthers? Over the weekend, multiple residents of rural Vineland, New Jersey phoned their local police department to report an enormous black creature wandering through the woods near their homes. The pictures taken of the beast (above and below) clearly show a large cat. 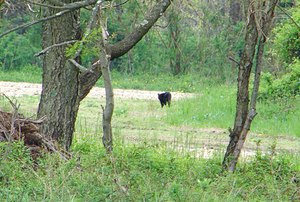 Many believe it to be a black panther--a species which, (it should go without saying), isn't native to New Jersey. Oddly enough, reports of "mystery cats" are common throughout the US and other parts of the world. Cryptomundo has a large list of sightings in states such as Texas and South Carolina. But perhaps the strangest sighting of all comes from Surry, England, where a panther-like creature has been repeatedly spotted over the past twenty years. The Beast of Bexley, as it's known, was photographed early last year by a woman who claims to have captured the creature crouching in her garden. HOW the heck did a panther get all the way ove here?